Ozzie Norton (Nelson) and his band which includes dancer Betty Blake (Keeler) are about to open a nightclub near Lambeth Technological College. Before they open, college professors, the sheriff and daughter of the college’s president Harriet Hale (Hilliard) coem to shut down the band because the club is too close to the campus. The club later reopens with Ozzie and his band to help recruit students to the financially floundering school. -Husband and wife Ozzie Hilliard and Ozzie Nelson star in the film as love interests. This is the epitome of a 1940s “B” musical: thin plot, jiving music and celebrities who aren’t exactly on the A list. I think the thing that I find most interesting is the cast. Most people know Harriet Hilliard and Ozzie Nelson from their 1950s TV show “Ozzie and Harriet” starring themselves and their songs. I always find it interesting to see them in 1930s and 1940s films, playing young people rather than parents. See Ruby Keeler in her last film was also an interesting comparison to her early Busby Berkeley directed musicals. 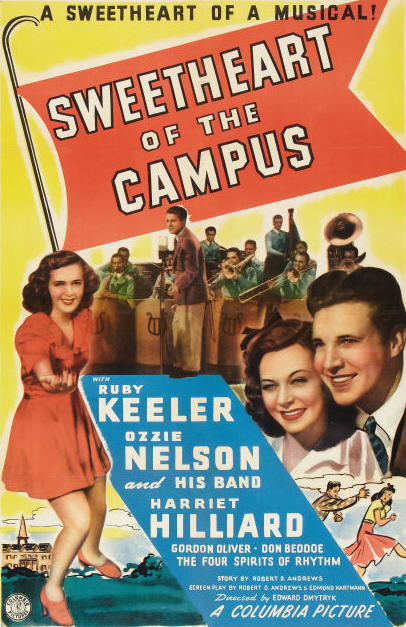 Her tap dancing seemed much more fluid and graceful in “Sweetheart of the Campus” compared to her “hoofing” in films like “42nd Street” (1933). After this film, Keeler left films and appeared in a few television shows. “It (Sweethearts) was so bad, I had no regrets about leaving,” Keeler was quoted in the book “The Women of Warner Brothers” by Daniel Bubbeo. “Sweetheart of the Campus” is simply fun and entertaining but nothing to write home about. It has music that you tap your foot to and a plot that can keep you interested enough for 67 minutes. 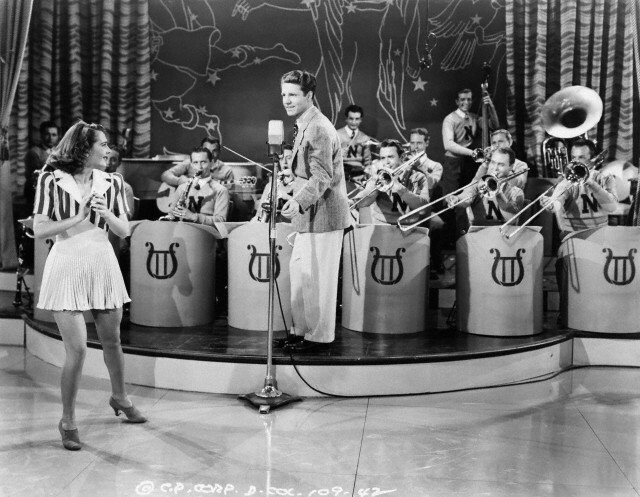 This entry was posted in Musical Monday and tagged Musical Monday, Ozzie and Harriet, Ruby Keeler by Jnpickens. Bookmark the permalink. Ozzie and Harriet are so adorable together. Harriet seemed the bigger star of the two early on (at least by Honeymoon Lodge, 1943). My impression is that changed when they went toTelevision.